The Bass culture team took the first session at last weekend’s Musica Scotica conference in Aberdeen. David began by talking about ‘The urbanisation of Niel Gow’s music’. Live illustrations went down a treat with the delegates! Next, Barnaby talked about ‘The Campbell Canntaireachd Manuscripts of Pibroch (c.1782-c.1819): interpreting a ‘cloud of witnesses”. Singing from Campbell’s unique canntaireachd notation, Barnaby made creative use of the audience by inviting them to hum the drone as accompaniment. It’s fair to say that the drone was vigorously supportive! Finally, Karen spoke about ‘Scottish airs in London dress: vocal airs and dance tunes in three 18th-century London collections’. Whilst she struggled to find a way of getting live music into her talk, which was essentially about bibliographical detective work on some Scottish music from London’s publishing quarter in and around St Paul’s Churchyard, Mother Nature herself came to the rescue, adding to the ambience by illustrating the mists of time with a dense and almost tangible ‘haar’ over the north-east coast! Nonetheless, I discovered they published Thirty Favourite Scots Songs in two volumes, as much as a decade before the Muses appeared. A Thompsons catalogue listed Scots Songs, circa 1781; and for a while I wondered if these books were actually published by the Thompsons, or were just Bremner’s Thirty Scots Songs, included in the Thompson’s listing because they were selling copies of the Scotsman’s works. However, there are still a couple of copies of Thompson’s Thirty Favourite Scots Songs extant, so I went to see the set at the British Library in London, armed with a print-out from the Eighteenth Century Collections Online of Bremner’s more famous collection for comparison. Why call a train a “sleeper”, if you don’t get a good night’s sleep in it? Something of a misnomer in my opinion! 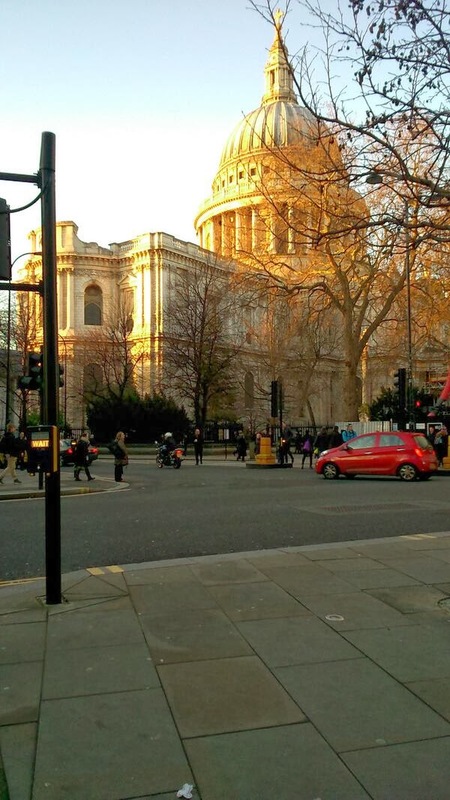 Still, I arrived in time to head for St Paul’s Churchyard for my breakfast – St Paul’s looked gorgeous at daybreak and then clothed in golden sunlight – probably better than the view enjoyed by the Thompsons, for James Raven (p.55, ‘Constructing Bookscapes’, in Mappa Mundi,ed. Jacqueline Murray, 2001) reports that in 1785, as William West looked back from Blackfriar’s Bridge, he ‘could only just perceive St Paul’s with its dome towering amid the smoke and fog that surrounded it’. The Churchyard was nice, too, but completely different to how it would have looked then, since the Blitz totally obliterated the buildings around St Paul’s. And as for Cheapside – if you’d brought the Thompsons by Tardis into the early 21st century, and dropped them off with their backs to St Paul’s, then I doubt they’d have known where they were at all! I had a bacon roll in Starbucks, looking appreciatively at St Paul’s, then made my way back to St. Pancras. Once in the Music and Rare Books reading room, I looked at a set of English, Irish, ‘Scotch’ and ‘Welch’ piano duets, copying out a few incipits for future reference. And then I devoured those Scots songs. But there was something interesting about them – lots of songs were about “Jockey”, or were described as “Scotch” – two clear indications that these were pseudo-Scottish songs written for an English market. Furthermore more, many of them were ‘as sung’ by popular named performers in eighteenth century pleasure gardens – primarily Vauxhall Gardens*, or Ranelagh in Chelsea. The nineteenth century William Chappell called such repertoire ‘Anglo-Scottish’ – a fair description. There weren’t many songs in common with the Scotsman Bremner’s collection, and only a small handful had been borrowed in their entirety from Bremner, in the same key or slightly transposed. Often there was a separate part printed at the bottom of the page for ‘German Flute’ or ‘Guittar’, in a transposition that would allow the tune to sit better under the hands of the instrumentalist. At the very foot of the page, some of the songs had the intials of the family partners at the time when individual songs would have been published. With the aid of two trusty music bibliographies by Frank Kidson, and later William C. Smith with Charles Humphries,I established that the whole collection, dated as approximately 1790 by the British Library, couldn’t possibly have been compiled before the latest partners’ dates – circa 1779. This does suggest that the catalogue circa 1781 most likely was alluding to the Thompsons’ Thirty Favourite Scots Songs, and not to Bremner’s set, although it would take a bit more detailed detective work to see if I could establish a later date for any of the Thompson’s Thirty Favourite contents. Suddenly, four and half hours had vanished. My new ghostly London friends accompanied me down to the British Library Georgians exhibition. I swear the Thompsons, Robert Bremner and James Hook stood and had a good look at the material relating to popular dance and its musical accompaniment! There’s a newish book (2011) about Vauxhall Gardens by David E Coke and Alan Borg, which I rather fancy reading. In a sense it’s a bit off-topic for someone studying Scottish fiddle tune accompaniments – and yet, at the same time, it’s about one of the most important places where middle- and upper-class Londoners would have sought their entertainment, for music, dancing and sheer spectacle. But when I returned to Glasgow, I remembered something else which is a truly bizarre coincidence. We lived in North Shields on Tyneside, for a couple of years. My husband was the organist at Christ Church Parish Church. On odd Sunday nights, I deputised for him there. We can thus both claim the rather rare distinction of having played the instrument that Georg Frideric Handel once played – because the basis of the Christ Church organ is none other than the one from … Vauxhall Gardens! It was brought to Tyneside around 1820. Don’t you think the ghosts of the Thompsons, and John Walsh, the publisher of much of Handel’s operatic material, would at least have treated me to a coffee in St Paul’s Coffee House if they’d known that? My focus has shifted, temporarily. Although most of my subjects are north of the Border, I’ve been looking at a couple of very interesting London-published collections of national songs from the late 18th century – the Thompson family publishers’ Caledonian Muse and Hibernian Muse. (Try as I might, I haven’t yet found a Cambrian Muse, but next time I’m in London, there are sources I need to check, just to be sure!) The Thompson family traded at the sign of the Violin and Hautboy, 75 Saint Paul’s Church Yard, in London. Meanwhile, Joseph Johnson, a politically radical literary publisher – he also published Non-Conformist church literature, and encouraged women writers, too – was just three doors along at no.72 Saint Paul’s Church Yard. I’ve discovered an unexpected connection between the two. I’ll be writing more about this in due course, so I am going to be irritatingly secretive for a while! 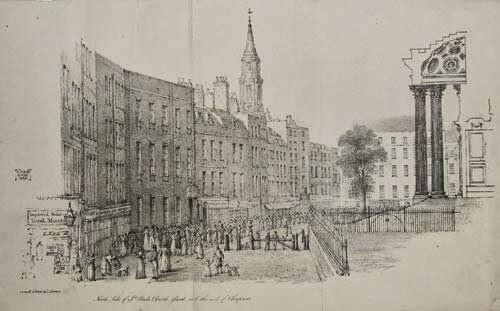 To my joy and delight, Hilary Chaplin, a historian and music-lover who tweets @hilaryssteps, has been tweeting pictures of old London, and generously found me a wonderful etching of St Paul’s Church Yard just a couple of decades after the events I’m interested in. I love to be able to imagine “my” musical and publishing ghosts in their natural environment, so I’m delighted to share this picture. Hilary tells me that in the foreground, people are looking out of Bowles and Carver’s Print shop, yet another firm nvolved in the printing/publishing/bookselling trade. The area was riddled with them! This firm was at 69 St Paul’s Church Yard – incredibly, just literally a couple of doors away from “my” people. Twitter contacts are so collaborative – I love it. Thanks for your help, Hilary! . Smith, William C., and Charles Humphries, A bibliography of the musical works published by the firm of John Walsh during the years 1721-1766 (1968). A century before, Andrew Wighton bequeathed his Scottish music collection to the City of Dundee; the City Library is proud to curate this collection in the Wighton Centre, built about a decade ago. At the end of the nineteenth century, one particular volume, lacking a title page, was deemed by musicologist Frank Kidson and others to have been connected with publisher John Wright. What does this have to do with Walsh, though? Well, Wright is known to have pirated Walsh’s publications. There is repertoire in common. They were wrong! I’ve been digging into the mystery volume, and can state that it is categorically not a Wright, but a Walsh volume. Pirate Wright has, in this case, been wronged. It’s not that Wright published a book using Walsh’s materials, but that Walsh published a book using his own materials – two different collections were assembled together to make this single, mystery volume. And it’s no mystery – we know exactly what it is. Virtually all the tunes in this book are also in two volumes of Walsh’s Compleat Country Dancing-Master, but the order is very random. I don’t think the Compleat Country Dancing-Master volumes are the ones whose plates were put together to make the single volume in the Wighton Collection. Indeed, I now know exactly which two volumes Walsh drew upon; a quick check with the British Library means I’ve identified all the collections involved in this intriguing story. Dating from the 1730s, the collections are earlier than most of the books we’ve looked at, and they’re not even Scottish – but they do contain Scottish, Welsh and Irish tunes, showing the popularity of this particular repertoire. Oh, and apologies to Pirate Wright for having wrongfully accused him for over a century. Hopefully his ghost will forgive us. Whatever he pirated, this is not one of them.